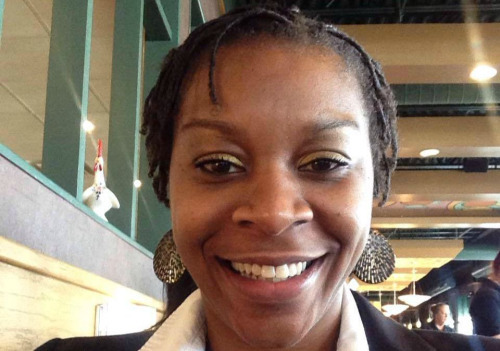 Why are White People Outraged Over Cecil the Lion but Not about Sandra Bland? TRIGGER WARNING: The following article contains discussion of racism and police violence. Author’s Note: This article is not suggesting that every white person is outraged over Cecil (let alone outraged over Cecil and not Sandra Bland). This article is also not suggesting that there aren’t any people of color who are outraged over the death of Cecil. However this question was asked by many people on the internet, and so thus the title, and thus the following is my two cents. Every time there is a trending topic, you can pretty much expect the following to happen. There will be a large amount of blog posts written about it. Some from the heart and some because people see an opportunity to bring more attention to their blog. Then, if the topic is trending long enough, there is the “inevitable” backlash. 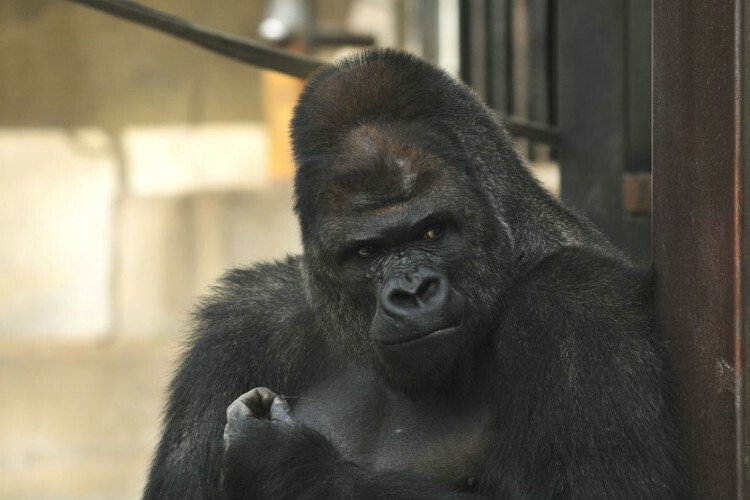 You may or may not recall #Shabani, the “heartthrob Gorilla”, who was trending not too long ago but for a very brief period of time. So brief that there simply wasn’t enough time for a backlash to occur. Sometimes the backlash is a reaction to a system that pins various groups against each other. A system that promotes the idea that there isn’t enough to go around, so you better get yours before your neighbor gets theirs. How often has there been situations where the powers that be say “Hey, specific oppressed demographic, you want your civil rights? We’ll give it to you, but it’ll be on the backs of these groups.” (As if that was the only option. As if that was your best bet.) 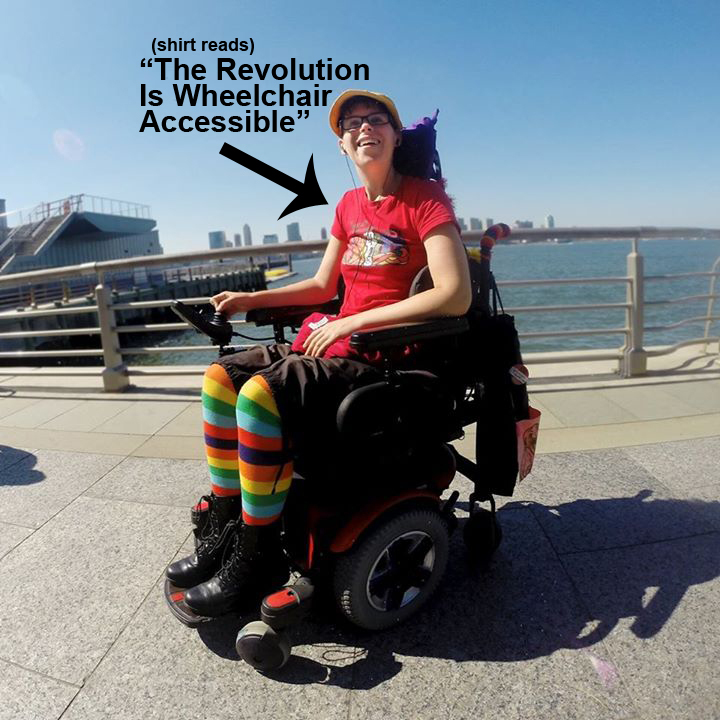 So, instead of intersectional activism (or realizing that all forms of oppression are actually connected and that we are far more powerful united, then we could ever be divided), it promotes Single Issue Activism, where every group is separately scrambling to be heard and to make progress. For some groups, there is so much injustice against them, that they are on the constant verge of nearly drowning in it, and don’t even have the energy to then take on other causes than their own. The system loves this, because when the powers that be can keep us exhausted, the system can remain status quo. The internet and the existence of trending topics is a prime example of that. Whenever there is a trending topic, other groups who perhaps do not feel heard, who are not getting the justice they deserve, see another cause in the spotlight and may start to feel angry or even bitter. Why are they getting all this attention but not my (worthy and valid) cause?! Some may start to panic that this will take away attention from their recent state of trending. Not because they are greedy for the spotlight, but they are validly desperate and know that the internet has a really bad habit of taking on a trending topic, utterly immersing themselves in it to the point of exhaustion, and then they move on. And if you’re aren’t directly impacted by a particular situation (like what’s going on in Palestine as one of many examples) then you have the luxury of moving on to the next trending outrage du jour. 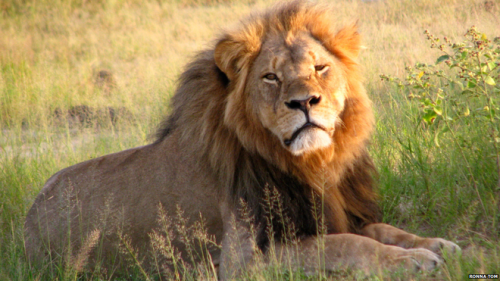 Cecil, The Lion has been the latest trending topic that people are livid about, and like clockwork the backlash has started. However, there has been one legitimate question that is going around, that I would like to address. And of course as a white person, I can not (and will not) say that I speak for all white people (seriously white bloggers, please stop saying that you do), and I certainly haven’t done an official survey by any means amongst all Caucasians, but as an animal rights activist and ally to the #BlackLivesMatter campaign, I do have some theories. Keep in mind, this is no way a comprehensive list and not necessarily in any order of importance. 1.) Because Racism. Let’s just get this one out of the way. The one we all knew existed. Some white people are livid about the death of Cecil, The Lion but do not give a crap about Sandra Bland (or any other innocent person of color who was physically harmed and/or murdered by the police.) because they are racist. Having said that, here’s where it gets a bit more complicated. 2.) It’s A lot Easier To Get Pissed At That Hunter, Than It Is To Tackle Systemic Racism. It seems like this country can’t go a week without another innocent person of color being physically assaulted and/or murdered by the police. At times it’s just too much and a person may want to avoid (or at least take breaks) from the topic, because it’s so heartbreaking to see so much injustice (one after the other) and typically without legal consequence. I can’t even imagine what it’s like for people of color (particularly parents) to be inundated with bad news after bad news on a daily basis that directly and deeply impacts them on a very dangerous level. That being said, sometimes humans (even though they care) start to shutdown and go numb in response to a mind blowing amount of injustice. Sometimes (especially if they aren’t aware of the importance of self care), people burn out and feel helpless in creating change for a particular cause. And then along comes Cecil, The Lion. So Cute and friendly. Plus he’s endangered! And he was killed how?! And while said police brutality related deaths are often met with little consequence, Time Magazine recently reported that the government has introduced The CECIL Act which aims to “curb trophy hunters.” A baby step in the right direction, but progress nonetheless. The people have spoken and the government reacted in a pretty timely manner. 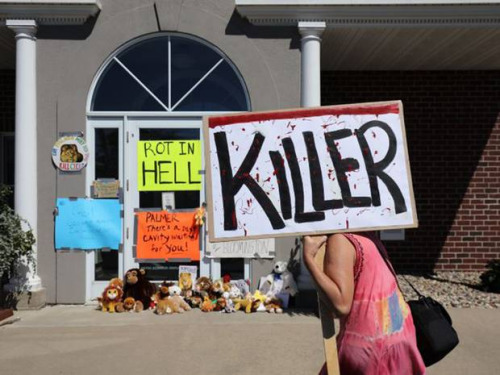 With Cecil, people can be outraged and have way quicker results (at least addressing the immediate issue. The root of the problem? Meh. The nation is not as interested.) There’s no “Yeah, but what about Lion on Lion crime” or victim blaming, thus making the mainstream conversation really really easy. “Hey are you pissed off as to what happened to that lion?” “Yes!” “Great, me too!” “Let’s discuss and bond over our outrage” Done. 3.) The Hypocrisy Factor One thing that animal rights activists deal with (at least the ones who advocate for all animals, not just the Cecils and Shamus of the world) is the fact that our society is highly hypocritical when it comes to our compassion for animals. People are so pissed off at this hunter who murdered Cecil, to the point where some have adopted a mob mentality and are calling for harm to the hunter. They will frequently post about it, as they eat their chicken with bacon and cheese sandwiches and type with great fury while wearing their leather boots. Meanwhile, this idea of selective compassion for animals is considered totally normal in our society, but for the animal rights activist, the hypocrisy can be frustrating as all hell, and this frustration often results in this particular issue becoming their main focus. “But, question: how can people make an animal and not another human being their main focus?” This naturally is a touchy subject (and probably an article in itself) especially considering that historically humans have compared other humans saying they’re “like animals” (and thus inferior) in order to justify oppressing the living crap out of them. However, it should be noted (like all false ideas of superiority) that just because one group decides and declares themselves superior, it doesn’t mean that it’s true. That is why many animal rights activists reject the concept of speciesism (the idea that one species is by default superior over other species and thus it’s okay to oppress them), and go with the idea that we are all animals (which is actually scientifically accurate). 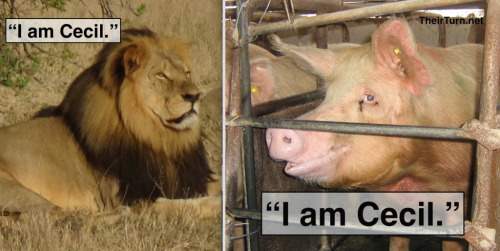 But why would an intersectional animal rights activist (who advocates not just for the non-human animals, but for the human ones as well) make Cecil their focus? 4.) The Small Window Of Opportunity. Even with the success and popularity of such films as Blackfish (which made a huge dent in Seaworld’s profits and challenged the way our society views certain animals), a conversation about animal rights (outside of the animal rights movement) is just not that common. Even more rare is when it involves “livestock” aka: the animals we have deemed as nothing more than “food”. We were raised to save the dolphins but eat the tuna. 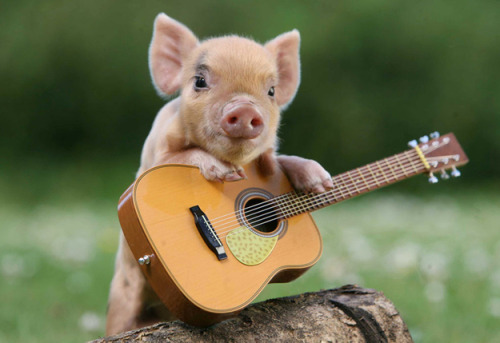 Cats are family but pigs are bacon. Thus when a situation like Cecil comes along, where an animal rights topic is actually trending? Small window of opportunity! (echo echo echo). Like I said. Sometimes people are focusing on Cecil, The Lion and not horrific situations like Sandra Bland because they are flat out racist, and that’s all there is to it (and there’s no excuse for it.) But sometimes it’s a reaction to a system that has all of us desperately scrambling to be heard, and sometimes at the expense of hearing each other. 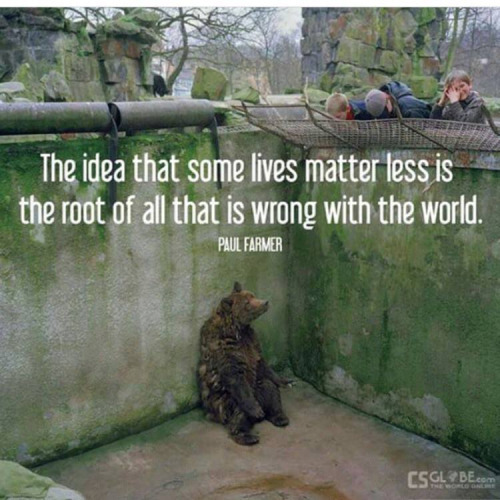 This entry was posted in Nonhuman Animal Rights & Speciesism, Whiteness & Critical Race and tagged Animal Rights, Black Lives Matter, Cecil, Hunting, Racism, Speciesism by Vegan Feminist Network. Bookmark the permalink.